We developed two new trips for 2007, the Engadine Summit Series and the Berner Oberland Ramble. Here’s a quick glance at the Engadine Summit Series. We’ve organized many trips to the Engadine over the years but in point of fact, the standard Engadine Trek, without amendments, is still one of the least strenuous tours that we offer. This year we thought it would be exciting to design something a little different from our traditional trek, and the result is a tour that spends more time on the trail AND is a bit more physically engaging. In short, the Engadine Summit Series appeals to hikers who desire two things: More time on the trail and less time spent moving from hotel to hotel. We still offer the traditional Engadine Trek, but the Summit Series will surely delight those hikers that want a more challenging tour. 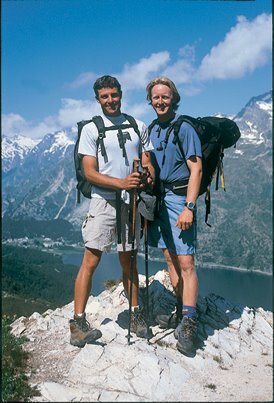 Two of our head guides, Daniel Sundqvist and Ken Fuhrer, designed this tour as a more strenuous version of our traditional Engadine Trek. Furthermore, they developed the name of the tour, Summit Series, in order to underscore the basic purpose of the trip, which is to enjoy the many mid-height, yet un-glaciated peaks that the region is famous for. If you like to climb or bag peaks, then this tour is for you. In addition, and just like our standard tour, we stay in many of the superb hotels and inns that our clients have grown to love over the years. Unlike most of our other treks though, we stay in almost every village for two nights at a time, thereby offering more time to enjoy our favorite establishments and cuisine. We will also offer two hiking options each day in order to cater to individual desires. Day 1 Travel independently by rail to Zuoz. 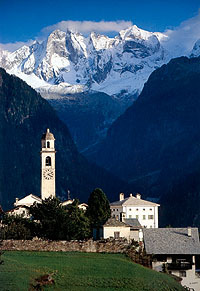 Zuoz is unique among the villages of the Lower Engadine. It is the first vantage point from which you can see the high glaciated peaks of the Upper Engadine. It is also a village, that while ancient and rich in the finest architecture of the region, sees virtually no tourist traffic. Tonight we’ll stay in a marvelous, old world hotel, centrally located on Zuoz’s main street. Day 2 Enjoy a warm-up day to one of our favorite high mountain huts above Zuoz. The views of the Palu and Bernina massifs to the southeast are superb. Descend near the old Albula Pass road to La Punt or Chamues-ch for transport back to Zuoz. Return to Zuoz hotel. Day 3 A short bit of train transport will deliver us to one of the Upper Engadine’s greatest attractions, a funicular with arguably the finest vista in the Alps. From the top station, we’ll traverse to the east along a rocky bench, to reach the summit cone of one of the highest summits in the region accessible to hikers. Coincidentally, there is a refuge just a hundred meters from the top. Here they serve superb soups to complement the otherworldly views. Descend to Pontresina and a warm and welcoming inn in a quiet section of the village. Day 4 Our itinerary for today’s hike takes us out of the village of Schlarigna, made famous as the finish village of the renowned Cresta Run, perhaps the world’s most famous bobsled course. We hike into remote and rarely traveled terrain behind the summits of Las Tres Fluors and beneath the rocky Piz Ot. Descend to Samedan for bus or train transport back to Pontresina. Return to Pontresina hotel. Day 5 The day begins with a gentle ascent up one of the Alps most pristine “U” shaped valleys. Carved out by glaciers over the millennia, this valley cannot fail to delight. We’ll hike all the way to the head of the valley where a charismatic hut has been fancifully placed right on the edge of the moraine adjacent to a quickly receding glacier. Traverse back through a notch to return to the main Engadine valley for bus transport to idyllic Sils Maria, and another superb old-world hotel. Day 6 Numerous summits are accessible for hikers from Sils Maria and we will choose among them for today’s itinerary. From these peaks we begin to see into the wild and spectacular Val Bregaglia to the south. Massive granite walls emerging from lush green lower valleys on the Italian border, characterize the Bregaglia. Return to Sils Maria hotel. Day 7 We’ll travel one of the regions most rarely visited areas but on magnificent trails. High above the Val Bregaglia we’ll ascend to a pass above our final destination, Soglio, one of the most charming villages anywhere. We’ll descend to Soglio through numerous rustic, but active tiny farms and hamlets. Enjoy your last night in Soglio as you watch the alpenglow embrace the granite spires of the Bregaglia while dining on local specialties. (The very top photo offers a small glimpse of the sciora range towering above the quaint little village of Soglio). Day 8 Depart. It is generally not possible to meet same day flights out of Zurich. From Swiss point of entry to Swiss point of exit. Please contact Ryder-Walker if you have any questions regarding the Engadine Summit Series or any of our tours. We’d love to hear from you.